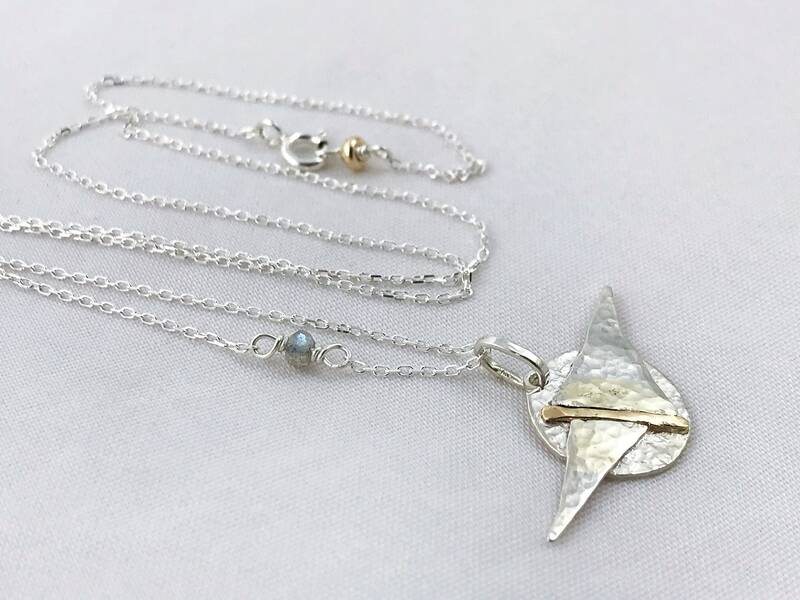 Embracing the spirit of play, imagination, and flights of fancy, this necklace features an abstract hammered sterling silver and 14k gold celestial shape. 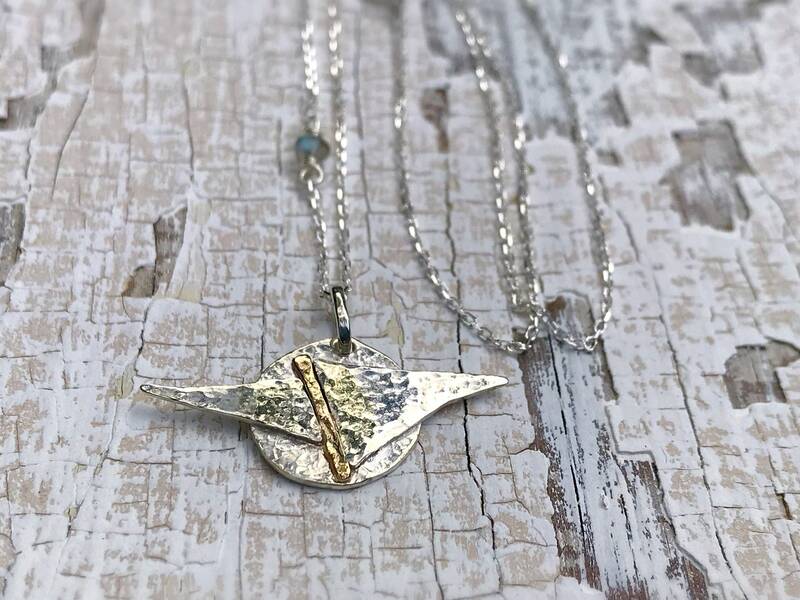 It is completely free-form hand sawn and forged out of sterling silver 20 gauge sheet and solid 14k gold wire, torch soldered, hammer textured, hand filed and refined into it's one of a kind contemporary avant garde design. 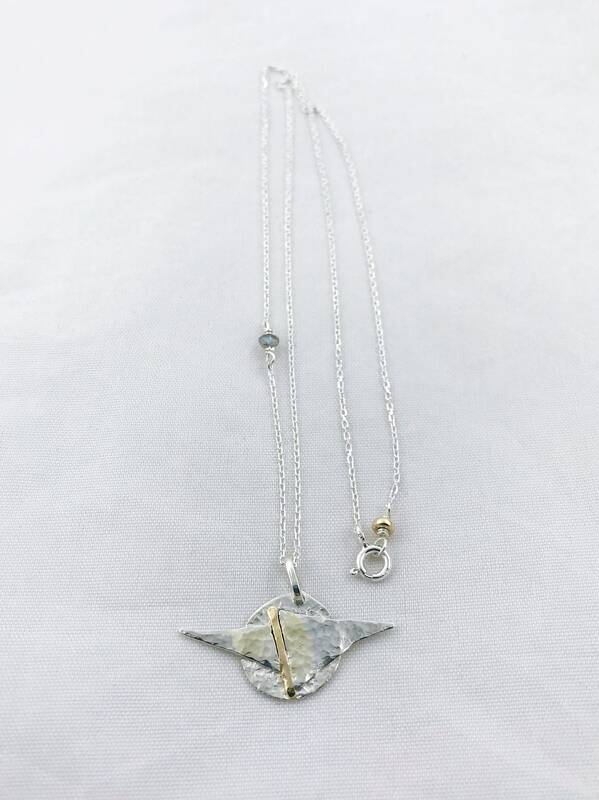 Dangling from a diamond cut sterling silver chain with labradorite and 14k gold bead accents. 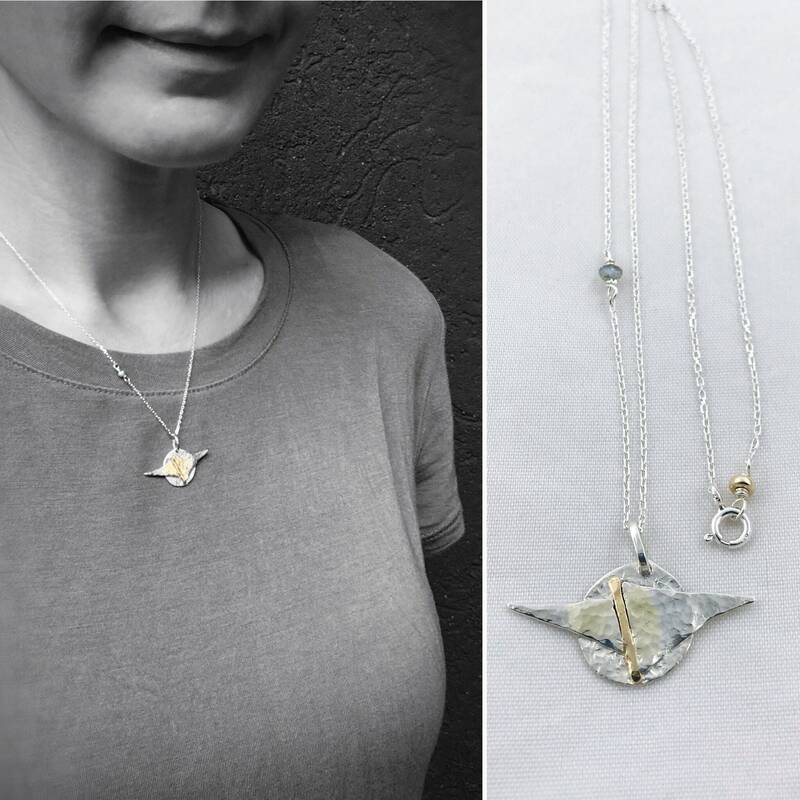 The design of this necklace is celestial in nature, but I wanted you as the viewer to interpret the forms in your own unique way from your own perspective. Some people see a planet when they look at it, some see a star-ship or a celestial being in flight, crossing in front of a distant moon or star on it's way to it's far off destination. I love that it can be interpreted in different ways and wanted to use the abstract shapes to create that effect. 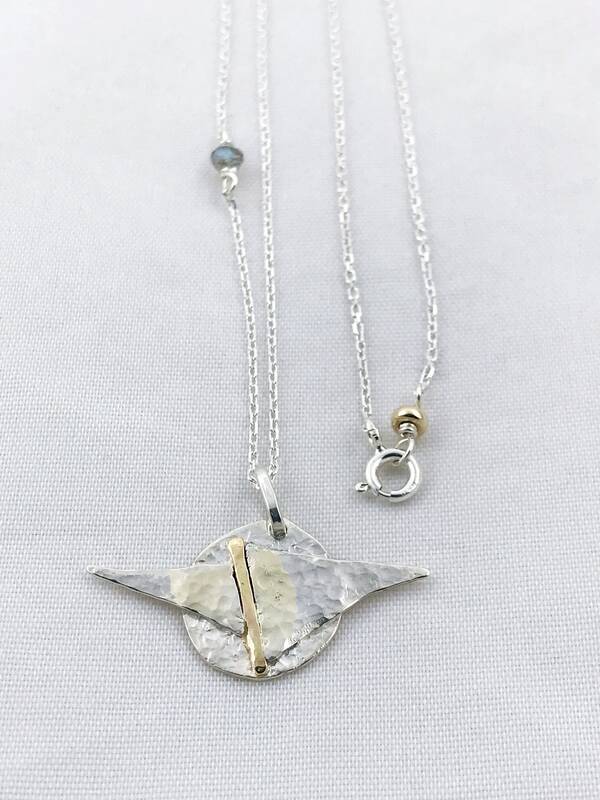 This necklace is one of a kind, you will receive the exact necklace shown in the photos. 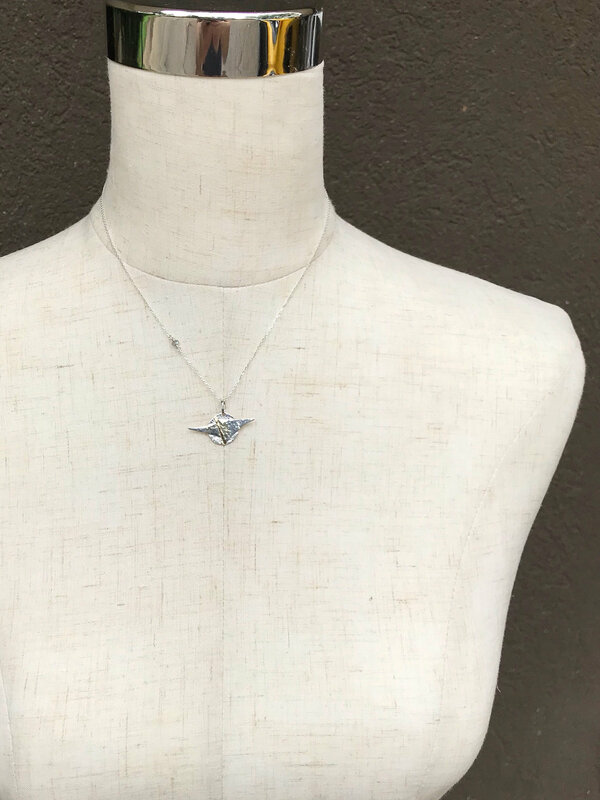 -Pendant measures 14mm (9/16") tall (not including jump ring which adds about 1/4"), 28.5mm (1 1/8") wide from wing tip to wing tip, 1.5mm (1/16") deep. 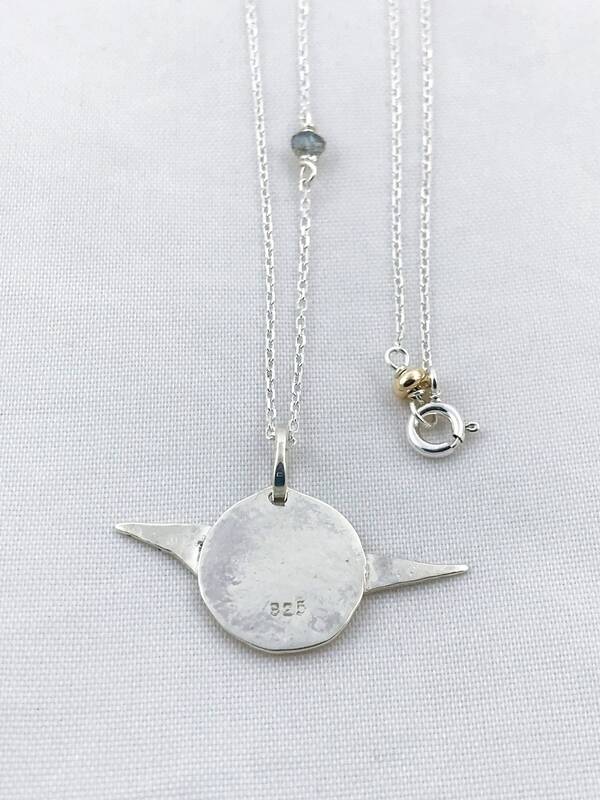 -Main circular base and triangular "wings" of the pendant are hand formed of solid 20 gauge sterling silver, with a solid 14k yellow gold piece forming the line shaped "body" between the wings. A bit of 14k gold has also been torch fired into the portion of the wings surrounding the gold piece to create a very subtle glow halo effect around it. -The whole piece is very rustic and rough-hewn in design, featuring different hammer textures and distressed edges for lots of light play and visual interest, as well as a truly unique handmade feel. -Pendant dangles from and hand formed solid sterling silver jump ring and hangs on a solid sterling silver 1mm width 17" length diamond cut cable chain with spring ring clasp. -Opposite the clasp, chain ends with a solid sterling silver loop and solid 14k gold rondelle bead, to compliment the 14k gold in the pendant. 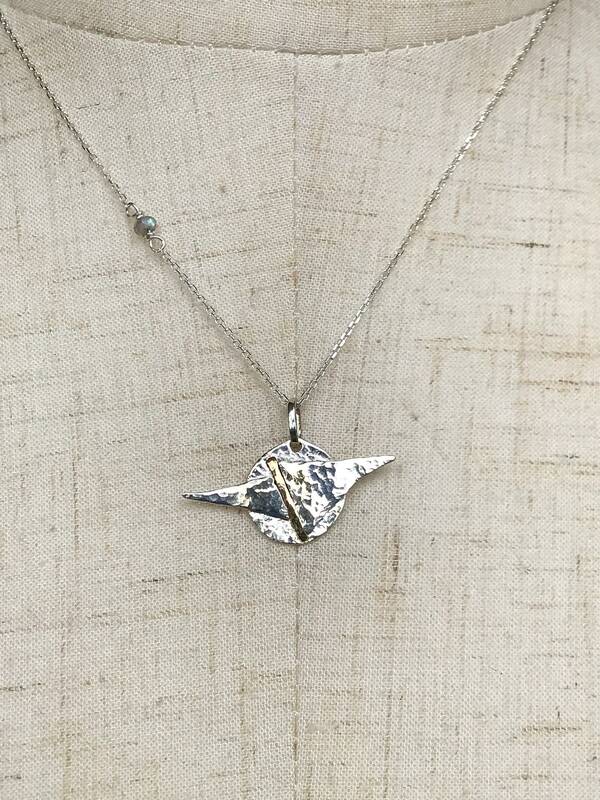 -Chain features a small 2x3mm faceted Labradorite stone that sparkles and shows lovely blue flashes of color. 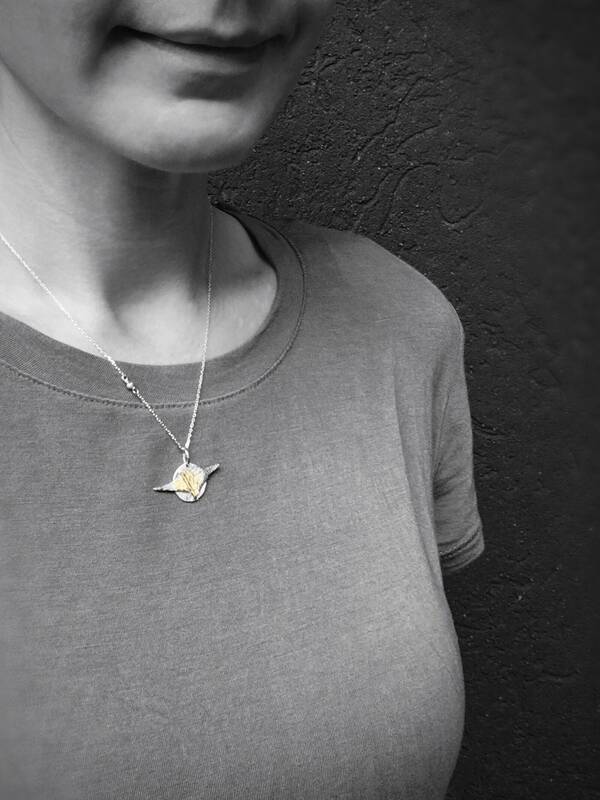 A small adornment that sits above the main pendant as a "distant star" feature on the chain. 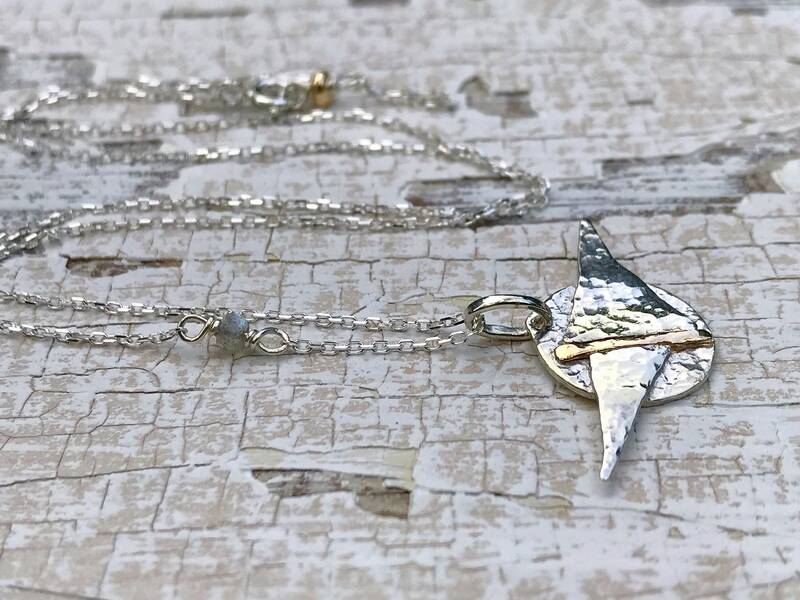 If you would like a chain length other than 17", or if you have any questions about this necklace or any of the designs in my shop, please message me and I'll be happy to help!